Homes Worth $200 Million at Risk Due to California Wildfire - 24/7 Wall St. The huge Northern California Rocky Fire has burned 70,000 acres and is not close to being contained. Homes valued at over $200 million are at extreme risk, according to CoreLogic, and the damage figures could go much higher. The figure might jump above $700 million if the fire spreads widely and reaches areas CoreLogic currently has rated as having “minimal risk.” Until the fire is entirely under control, the risk rating CoreLogic gives for these areas could change for the worse. Government Jerry Brown made the point, after examining the wildfire area, that climate change will continue to elevate heat and drought. Under these circumstances, he said, catastrophes like the Northern California Rocky Fire will not be anomalies, but a regular occurrence. That means the CoreLogic estimates for the current wildfire problem indicate that costs for houses burnt down by these events will move into the billions of dollars in future years. Brown’s point is well taken. 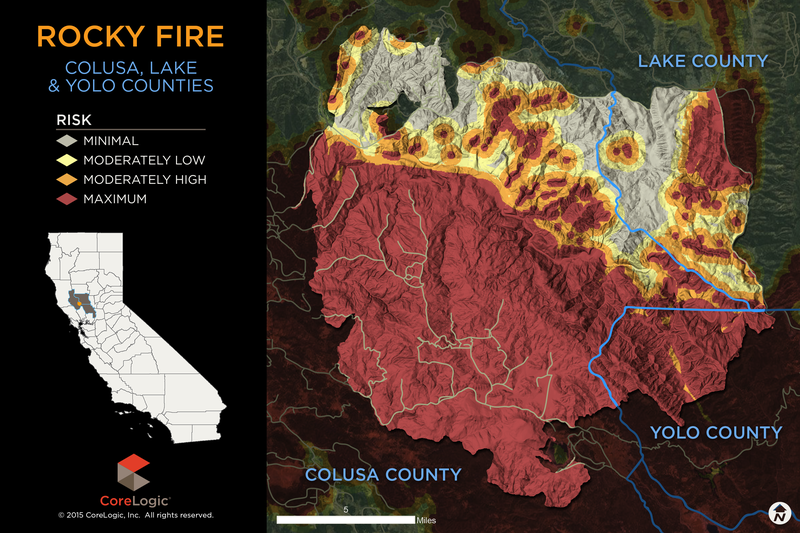 The current wildfire covers a section of California that suffers from unprecedented drought. Scientists expect the problem to continue. The U.S. Drought Monitor’s researchers report that 46% of California suffers from the worst level of drought, which is designated “exceptional.” Add to that the next level of drought — “extreme” — and the portion of California’s square mileage with one of these two designations moves to 71%. Virtually no expert expects these levels to change meaningfully for years, or even decades. Catastrophes like the Northern California Rocky Fire will not be exceptions to normal wildfires in the future. With that, the threats to home values will rise well above the CoreLogic estimates for the Northern California Rocky Fire.